What think tanks have to achieve and what is makes their contribution unique? Think tanks’ key audience and how to reach it? What resources do think tanks need and how can they develop them? How do think tanks evaluate their impact and learn from their experience? Research opportunities at the Wilson Center and Kennan Institute. 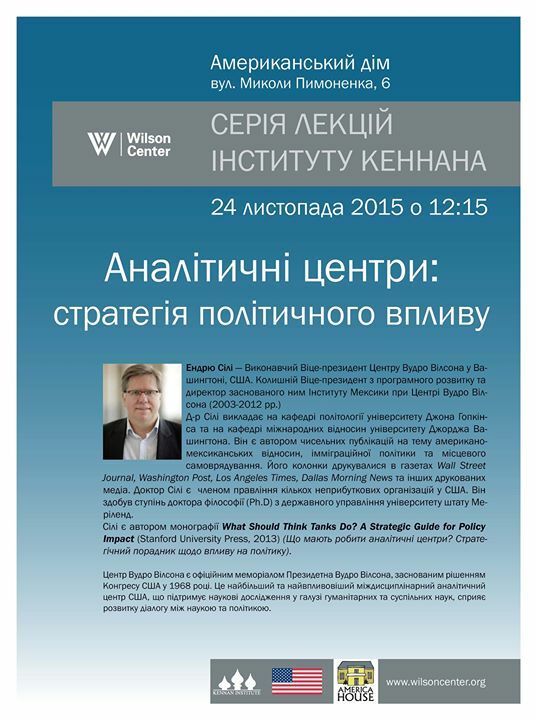 The lecture will be presented in English with simultaneous interpretation into Ukrainian. begin at 12:15 pm, at 2 pm light lunch will be served. Andrew Selee is a former Vice President for Programs at the Wilson Center and the founding director of the Center’s Mexico Institute (2002-2013). He also worked as professional staff in the U.S. Congress and with development projects in Mexico prior to joining the Center. Selee teaches at John Hopkins University and George Washington University. organizations. He holds a Ph.D. in public policy from the University of Maryland. Selee is an author of What Should Think Tanks Do? A Strategic Guide to Policy Impact (Standord University Press, 2013). Remember to bring your ID to enter America House.